Electric-lime green is not a color I often associate with the watchmaking industry. Although it does feature in some very high-end designs, it is normally employed as the “wacky factor.” It reminds me of the kind of color Urwerk would entertain and harkens to when that brand released the UR-105 TA ‘Turbine Automatic’ watches in fancy colors. 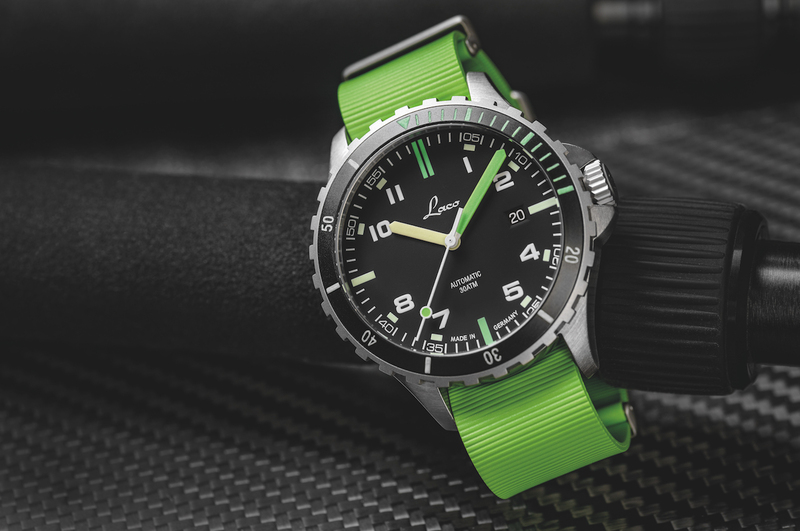 And while dark forest or British racing green are becoming more ubiquitous in the middle tier, the more dynamic shade employed by the Laco Amazonas Squad Watch is a seldom seen beast. After having this watch on my wrist for the past two weeks, I will say this: That’s a damn shame. When Laco reached out to me to ask if I was keen to test drive one of their new squad watches, I was given a choice among all four colorways. There is the very attractive Atlantic, which follows the same color format but with blue, instead of green, accents; the Mojave, which utilizes orange; and the Himalaya, by far the plainest of the bunch, with mostly white elements, bar the lone orange minute hand. Immediately, the green stood out as the most interesting, so I chose that one. I didn’t realize just quite how much the green stood out until I’d taken it outside at dusk. In low light conditions, the vibrancy of the green is absolutely stunning. It helps that the luminous material used on the bezel, in particular, is hyper-sensitive, but even without a moment of charge the color still manages to catch and enhance any of the dwindling light it finds. But enough about the green, for now. It may be the most arresting thing about this model, but there is plenty more to get excited about. 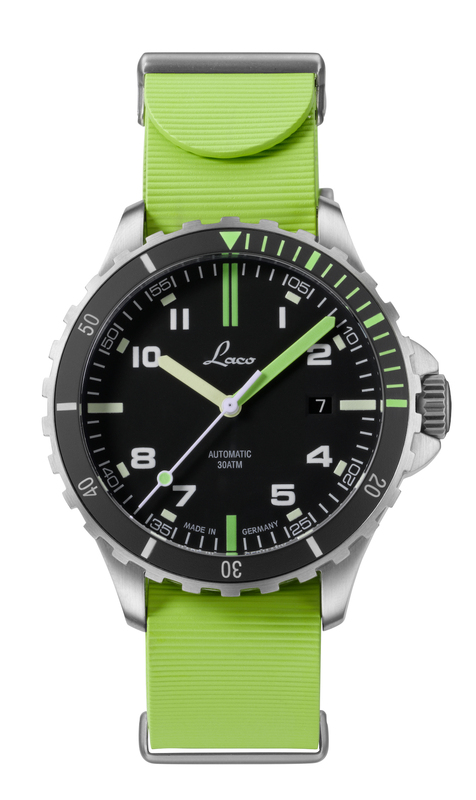 The Laco Amazonas Squad Watch is a robust character, with a 42mm case diameter and 13.5mm height. The Squad watch collection is marketed as a generic sport watch. They are not explicitly intended as dive watches, although they bear many of the characteristics one might associate with that genre. 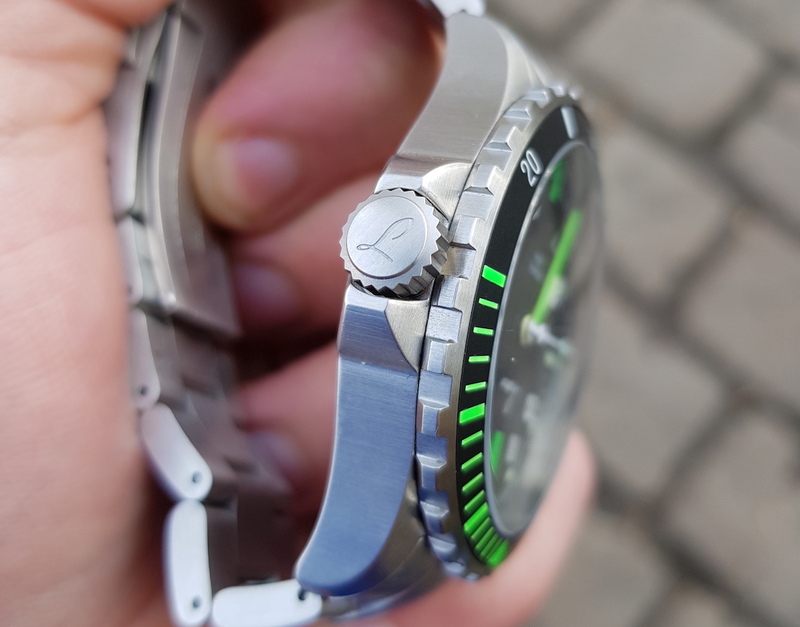 The water resistance is an impressive 300 meters and the screw-down crown provides total case security. The anti-reflective coating on the underside of the sapphire crystal means the watch can be read easily from any angle in any weather condition. 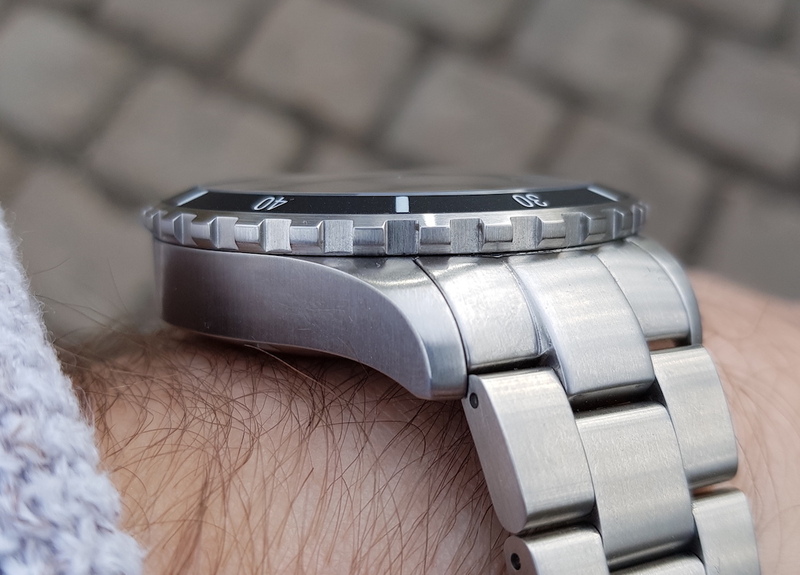 The 120-click unidirectional rotating bezel is excellently machined. The clicks are definite and reassuring, while the tooth-edge makes it easy to grip. 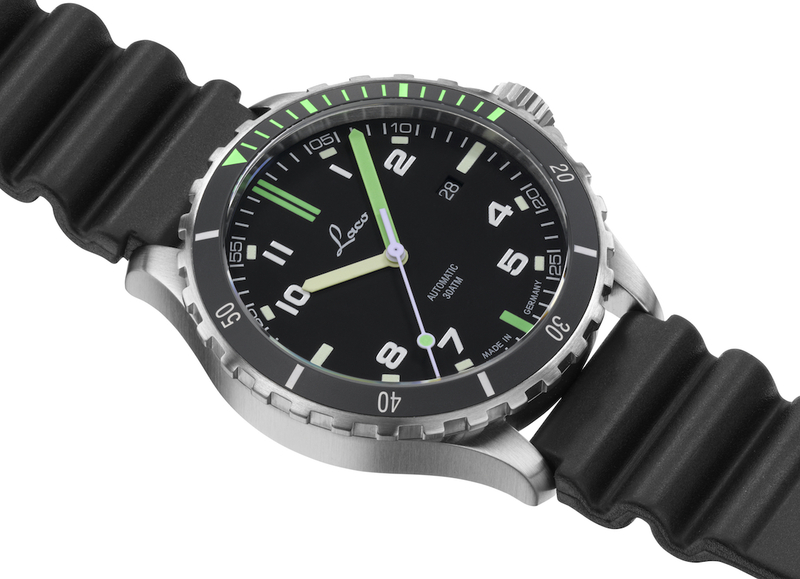 The matte, Super-LumiNova-filled ceramic bezel insert suits the utilitarian nature of the product. The watch stood up admirably to the battery to which I subjected it. Admittedly, I didn’t bang the steel into any particularly hard surfaces but the sapphire took and deflected a few knocks without any trouble. The finish, which is brushed in alternating directions, is appropriate for this kind of watch. That said, I would probably have preferred a blasted surface to really hammer home its tool-like identity. What the slightly more refined finish does is increase the watch’s wearability across situations. It’s not quite suitable for a suit and tie, but it certainly looks at home with casual wear. 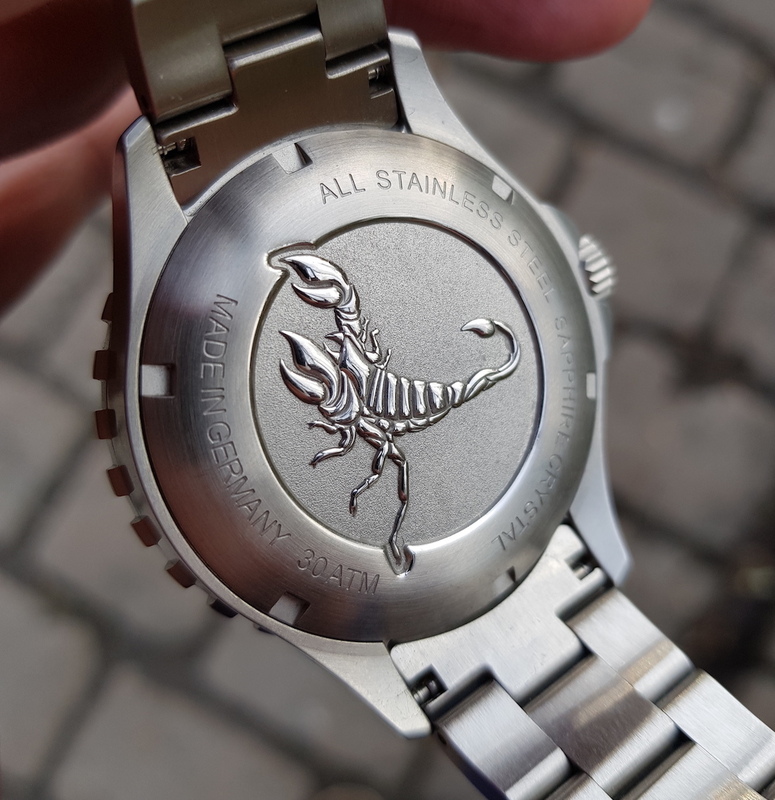 The caseback really nicely decorated with a cool Scorpion logo, which is one of the sweetest elements of the watch. It’s covering a pretty basic movement, and fans of this style of watch will likely prefer the characterful mascot of the Squad range over another incongruously added display back. I decided to take Laco’s description of this as an outdoor watch seriously. I have taken it out in my kayak, fully submerged it by falling off a paddle board, and thoroughly dirtied it with mud, sand, and snow in an attempt to get an accurate picture of how it performs in its intended environment. 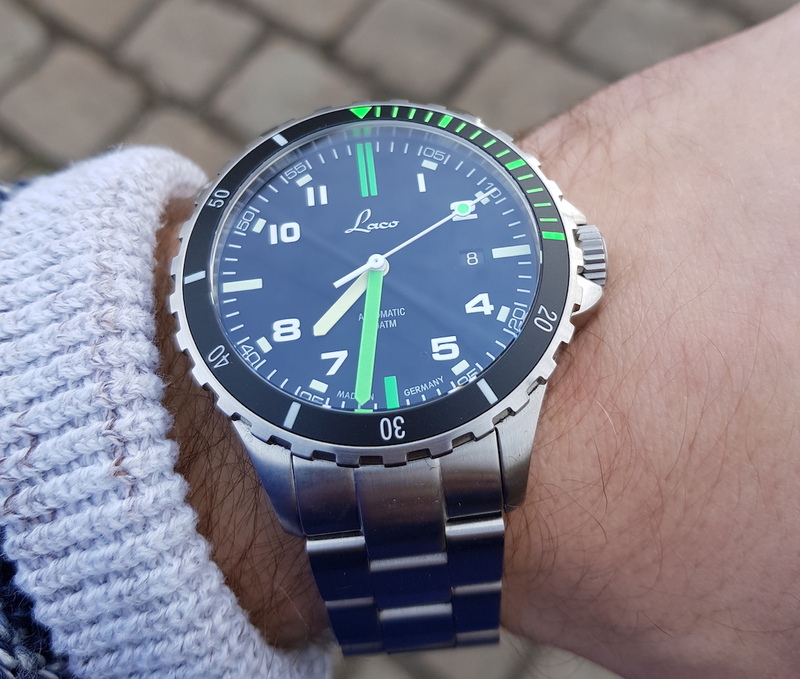 Although Laco supplied me with the lime green NATO pictured at the top of this article, and the black rubber strap, I opted to keep it on the bracelet for the majority of its test drive. I rarely wear bracelet watches; it is even rarer for me to wear one in an outdoor-sport environment. But I was curious. I wanted to see how the weight felt during activity. I imagined it would be uncomfortable, but the bracelet provided a good degree of balance for a watch head that does seem quite weighty when removed from the wrist. The clasp is a double-fold-over style. 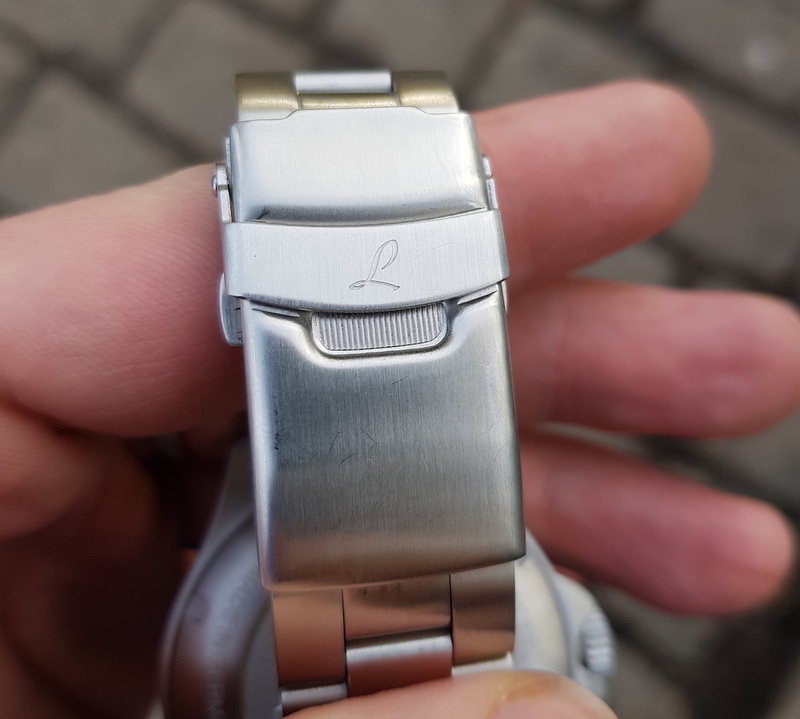 The initial click is solid, and the fold-down flip lock engraved with the Laco ‘L’ isn’t necessary to hold the bracelet securely, but it is welcome. It closes with a satisfying click, but its hinges are a little loose. This doesn’t affect its operation negatively, but until it is fastened it feels a little less refined than a clasp you’d expect to find on many competitor brands. However, it must be noted that the price for the bracelet is incredibly reasonable. At €89/$110 retail, it is very much forgivable that it isn’t manufactured with the same precision of, say, an Omega Seamaster 300m — a watch that sets the gold standard for value, despite coming in at more than three times the price of the Laco. 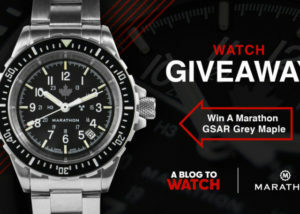 I like the watch and all, but what the heck is a “squad” watch? And what’s the link with the region state in Brazil? These marketing campaigns and naming conventions are getting ridiculous. I’m still trying to forget that foolish HYT Time is Precious article (“The dial, in all its glorious randomness, represents the beautiful chaos of life”. I mean c’mon, that’s a bit thick. 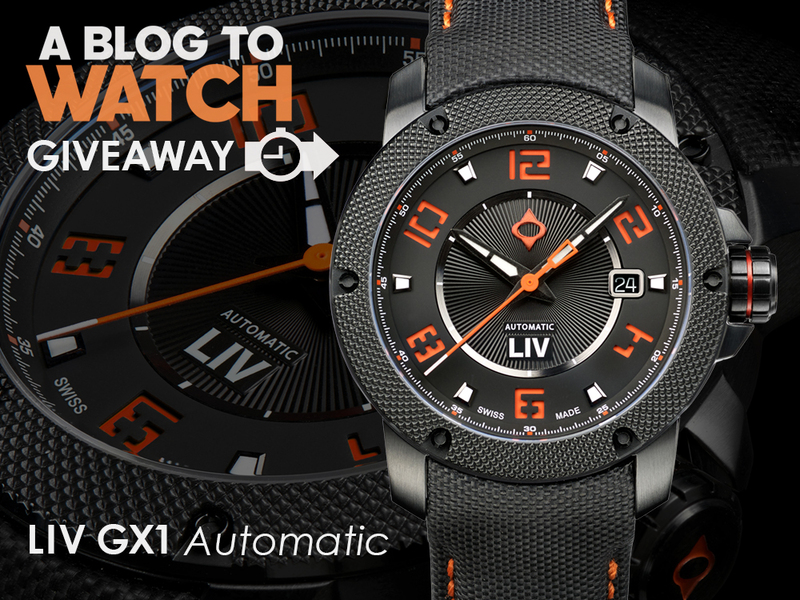 Besides the silly names, this looks like a solid watch are a very reasonable price. Totally agree, I have a Laco Flieger and they’re well built, affordable watches. 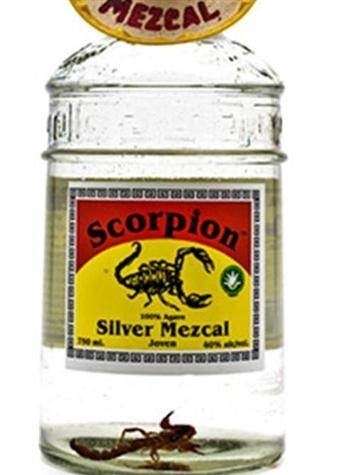 And yes, that is a scorpion in the bottle.